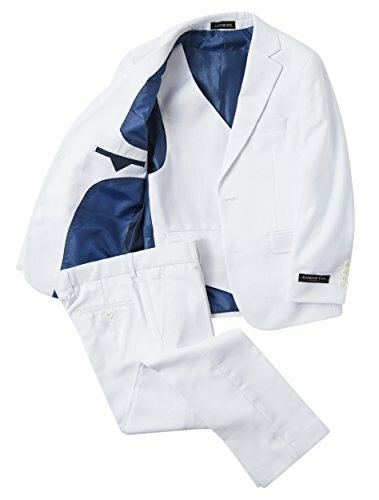 Give him a touch of sophistication with this complete Formal Jacket Vest & Pant Suit Set by London Fog! Our stylish boy's Suits are tailored trimmer (Modern Fit) than our popular classic fit suits. Ranging from sizes 4-18. These Suits sets are perfect to wear for all Special Occasions like Weddings, Communions, Graduations, Proms, Holiday Parties, Birthday Parties, Ring bearer boy, and all formal events. JACKET: Modern Fit (Trimmer than classic fit) 2-Button Front Closure, Notch Lapel, Two Front Flap Pockets, One Welt Chest Pocket, Two Interior Pockets, Dual Side Vents, Attractive Interior Lining. PANT: Modern Fit,-(Tapered Leg) Flat Front, Zip Fly with Hook-and-Button Closure, Button-through Two Back Pockets, Inner Adjustable Waist, Pre-hemmed, however if adjusted cannot be returned. VEST: 4-Button Closure, Two Side Pockets, One Chest Pocket, Adjustable Back Strap. PLEASE NOTE: Suits are sold as a set and cannot be mixed and matched. If you have any questions about this product by London Fog, contact us by completing and submitting the form below. If you are looking for a specif part number, please include it with your message.